The LEGO cinematic universe expands a bit more with this week’s release of The LEGO Ninjago Movie. Based on the popular line of toys, there’s already been a few Cartoon Network series over the last few years but now, with a big-name cast providing the voices, it’s time for a theatrical debut. The story follows Lloyd (Dave Franco), a member of a secret team of ninjas who defend the island of Ninjago. While he and the others, including Cole (Fred Armisen), Jay (Kumail Nanjiani) are taught by Master Wu (Jackie Chan) at night, during the day they’re ordinary high school students. Their primary foe, the one who’s constantly threatening Ninjango, is Garmadon (Justin Theroux) who also happens to be Lloyd’s father. So there’s a lot going on here. The first poster is pretty basic and not all that interesting but does get the message across that the movie is coming and that, as we’re told at the top, it comes from the same team that brought us previous LEGO movies. It just shows Lloyd standing at the edge of a pond, his ninja alter-ego showing in the reflection of the water. Not very compelling but it does what it needs to do. The second poster takes the perspective of someone on the ground looking up as all the ninja work their down through the trees. Everyone but Lloyd has their face covered with a mask to single him out as the main character. A few different series of character posters were released over the next few months, all of which featured different visual themes. One had each character in a different unique environment with some goal attached to them like “Be Green,” “Be Masterful” and so on to identify a different character trait or show what kind of skill each had. One shows each character standing in front of the mech suit, ship or transport they use for extra power and abilities. One puts each character in front of their own unique symbol. One presents the characters in what was meant to look like traditional Japanese paintings. A Comic-Con exclusive poster was given to attendees there that showed Lloyd and his evil dad along with the rest of the Ninjago team. It has kind of a retro poster feel and even was made to look distressed, like the poster for a kung-fu grind house flick from the 1970s. Another poster shows the cross-worlds elements of the story and is specifically meant to promote Dolby Cinema at AMC screenings, that branding clearly presented at the bottom. The rest of the poster has the Ninjago team looking out over the top of a roof, a real-life cat peering back over it at them. The first trailer makes it clear the story is filled with the same humor found in the previous LEGO movies, all revolving around the story of a heroic son who is out to defeat his evil father. From the outset the conflict between the two is laid out amidst all the fighting and other action. If you feel like you’ve just seen most of the movie’s best parts, you’re likely not wrong. This is pretty much what you can expect. The short trailer that was released at Comic-Con didn’t offer much that was new, just another look at the movie’s comedy and style. Specifically it doubled down on the daddy issues that drive Lloyd to stop his father and shows the real life cat the filmmakers included. 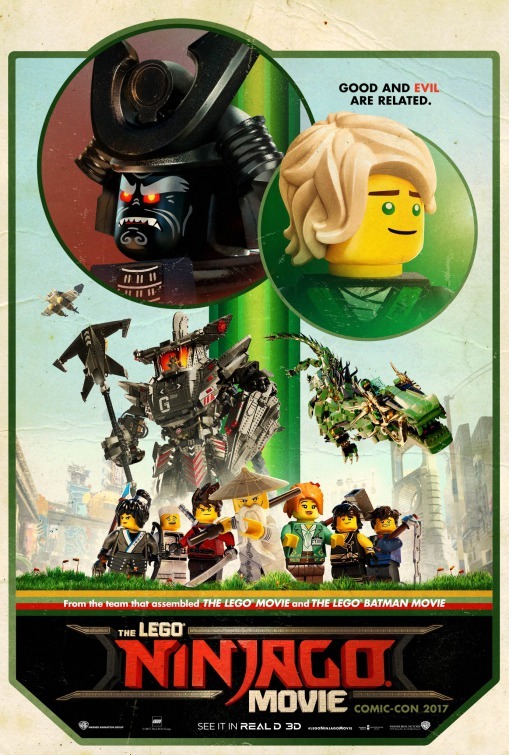 A full-length trailer was released at roughly the same time that starts off with Garmadon rampaging his army through the streets, cut with scenes of Lloyd asking his mom if his dad was always an evil warlord. Turns out she just thought he was ambitious, not actually intent on taking over the world. When duty calls all the ninjas take the fight to the villain, but Lloyd is determined to learn more about his father and so undertakes a journey of discovery. That leads to some unexpected teaming up between the bad and good guys. It’s funny in all the same ways the first one was, with the jokes flying fast and furious at you. Nothing all that notable here but it’s sure to get the attention of those who have made the other LEGO movies into hits. A battle scene greets you when you load the movie’s official website showing the Ninjago team taking on Garmadon in the streets of the city. In the upper right is a rotating series of prompts offering various activities for younger members of the audience. In the lower left is a button to buy tickets as well as links to the movie’s Instagram, Facebook and Twitter profiles. The photo on the front page is littered with buttons to various sections that are also accessible via the menu on the left. The first section there is “Videos,” which just has both of the primary trailers. “Fun and Games” is stocked with Games, Wallpapers, Posters and Activities for kids and others to download and play. Those Wallpapers can be easily added to whatever device you’re viewing the site on. You can get to know everyone better in the “Characters” section, which offers a short bio of that character as well as a poster featuring them to download. “Story” has a synopsis and the details on the cast and crew of the movie. “Gallery” lets you scroll through a number of stills, though these aren’t downloadable. Not forgetting about commerce, “Products” takes you to a page where you can browse and buy the various Ninjago sets LEGO offers. Finally, “Partners” has links to the companies who have teamed up with Warner Bros. to help promote the movie. TV spots like this one featured minimal footage from the movie, instead opting for a few brief clips framed by Chan telling a bad ninja joke. There may have been more traditional story-based commercials run, but I can’t find any of them. McDonald’s, which put movie-themed toys in its Happy Meal boxes. Key art was used in online ads while the trailers and other videos were used for social media ads. The first look at the movie came in a USA Today story that offered a still and comments with the filmmakers. Another new still came later in Entertainment Weekly’s San Diego Comic-Con preview issue. The studio put out a fun “greeting” video to the fans attending SDCC. The cast and crew showed up a panel there where they had lots of fun telling jokes, revealing new characters and more. Another new photo was shared in EW’s fall movie preview showing the whole team. That was followed by a fun back-to-school themed video. The cast would make various comments in various venues, particularly over the last month or so leading up to release, but nothing that seems to qualify as a concerted or purposeful press campaign. Let’s not even discuss how essential this movie might or might not be. That’s beside the point. It’s created in the same vein as not only the previous LEGO movies but the various “G.I. Joe,” “Transformers” and other cartoons over the years, as a means to sell toys and action figures. This is both a celebration of the fans that have made Ninjago into a hit line for LEGO and a way to reinforce the idea that they don’t yet have enough toys in that series. It hits the same kinds of notes as the campaign for the previous LEGO movies, emphasizing harmless violence and humor over anything else. More than anything, I come away from the campaign with the same questions I had about The LEGO Batman Movie, namely whether or not this takes place in the same universe at The LEGO Movie, meaning in a kid’s basement? Whatever the case, this is likely going to be a hit with the younger crowd, potentially even finally upsetting IT at the box office. Tagged: lego ninjago movie, warner bros.